References in Portuguese inventories to the carpets of “Castile” and the “Levant” became progressively more frequent in the first half of the 16th century and coincided with the period when representation of knotted carpets, in the form of Iberian and Turkish carpets, reached its peak in Portuguese painting. This fact is owed to the Muslim presence in the Iberian Peninsula. Pre-existing contact with Arab culture, as well as the production of knotted carpets, preceded the arrival of oriental counterparts and restricted their demand in the market. Facing an already-established network of Iberian, Turkish and North African manufacturers, carpet manufactories had to respond to the demands of a society well used to the consumption of exotic luxury goods. 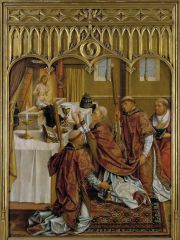 The Mass of Saint Gregory originally constituted one of the panels from the predella of an altarpiece in the church of the Convent of São Francisco. The predella comprised 16 paintings depicting scenes from the Eucharist. The painting seen here represents a story made popular in the Golden Legend of the moment when Christ reveals himself on the altar to Pope Gregory; Christ responds to Pope Gregory’s prayer for a sign to convince a deacon, who had earlier confronted him with doubts about the doctrine of transubstantiation. 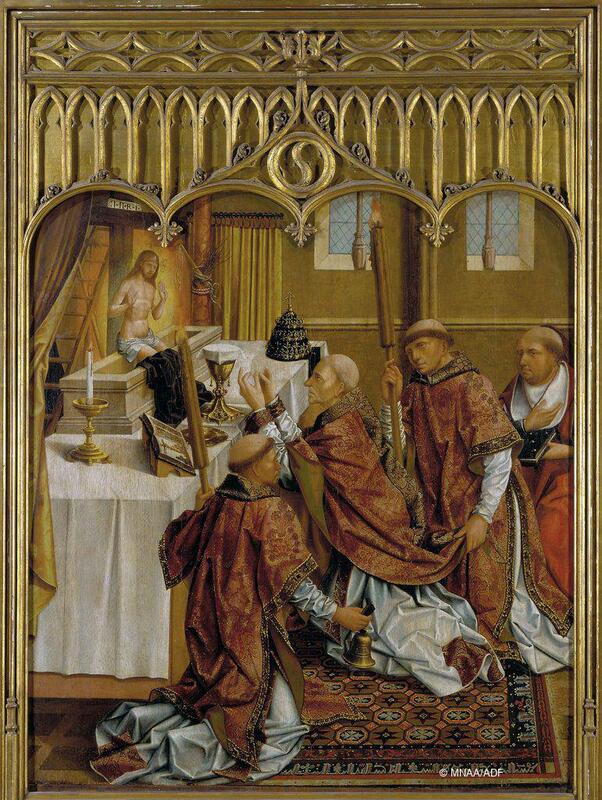 In the painting, St. Gregory kneels before the altar on a carpet of Spanish origin. The carpet’s field is filled with octagonal medallions in which stars and quatrefoils are alternately inserted; the border is filled with a pseudo-kufic design interwoven with stylised floral motifs. Hallett, Jessica, “Queen Leonor’s Carpets”, in Alexadra Curvelo (ed. ), Casa Perfeitíssima 1509‒2009: Celebrating 500 years of the Foundation of the Convent of Madre de Deus, 1509‒2009, Lisbon Ministério da Cultura/IMC/Museu Nacional do Azulejo, 2009: 378‒81.